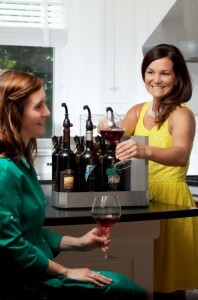 littlewine servers™ are perfect for glass-a-night wine lovers who find their wines beginning to spoil before the bottle’s even halfway finished. in the modern, commercial wine preservation industry since 2002. The company pioneered the first National Sanitation Foundation (NSF) & comprehensive UL Electrical Safety Standards in wine preservation equipment. In 2016 the US Patent Office awarded patent on our simple, breakthrough gas management method which dramatically increases the efficiency and simplicity of gas-based wine systems. In 2008 we produced and marketed the world’s first multi-bottle champagne maintenance, preservation, and dispensing system. With rapid changes in packaging happening, ProWine developed the first dedicated ScrewTop Bottle Adapters for inert gas preservation systems in 2007. OZem Corp was founded as a commercial design and development consultancy in 1994 in California (SDC). The corporation migrated to Virginia in 2000. Our work on large commercial wine service systems began in 2002. We began a new project from 2010 to 2012 with the goal of reducing the complexities of inert gas preservation and wine dispensing to its simplest elements – designing around the fewest moving parts to make wine preservation easy and affordable for everyone. Doing so, we eliminated critical, systemic problems users have experienced with traditional inert gas methods. Compared to our existing products, the emerging system was, indeed, ‘little’. We nicknamed our development and testing work the “littlewine project”. The name stuck. With littlewine, you’ll have the benefit of preservation without the aggravation. We think you’ll love it because all you really want is just a good glass of wine! OZem Corp brands include OZ Winebars (www.ozwinebars.com) and n2vin® (www.n2Vin.com) as distributed and supported by ProWine Products, a DBA of OZem Corp., a Virginia corporation.